There are two forms of gutters: seamless and sectional. While you could save money by using sectional gutters, you won’t be as happy with the results, they are prone to leaking, they accumulate debris, and they won’t last as long. Instead, seamless gutters are the way to go when you live in Montana. Why choose seamless gutters over sectional? Seamless gutters are installed quicker. Less gluing and splicing means the job gets done faster. Seamless gutters last longer. Fewer joints and splices means that there are fewer weak spots. Seamless gutters shed water better. Every joint creates a ridge that the water must pass over; fewer ridges means free flowing water. Seamless gutters look better. A nice even sheet of metal looks cleaner and neater. Seamless gutters have fewer joints. When you have sectional gutters, the joints will inevitably leak. Seamless gutters fit better. These gutters are custom cut to the exact length of your roof. Seamless gutters are easier to clean. No ridges means no places for leaves, pine needles, and other debris to get snagged on. Whether you live in Billings, or if you live in Northern Wyoming, or if you live in Nye, Montana; we offer seamless gutter services to the entire area. We take pride in doing high quality craftsmanship, so you are left with a product that we would be happy to install on our own homes. 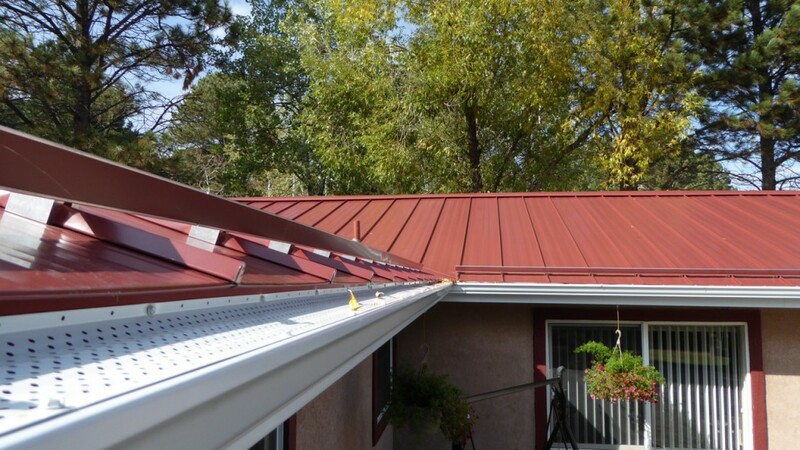 Beartooth Metal Roofing does all things metal. That includes running seamless gutters for houses (whether or not we did their roof). These gutters are durable, look great, come in a variety of colors, and will enhance your home. Give us a call at 406-839-0084 to schedule a time when we can come to measure your home or business and get you a quote on your gutters.